This Interview with Ma A--- describes events occurring in B--- village, Hpa-an Township, Thaton District in June 2015, including land confiscation, forced relocation, attack on a village and villagers, threatening, looting, arbitrary detention and threats to children’s right to education. 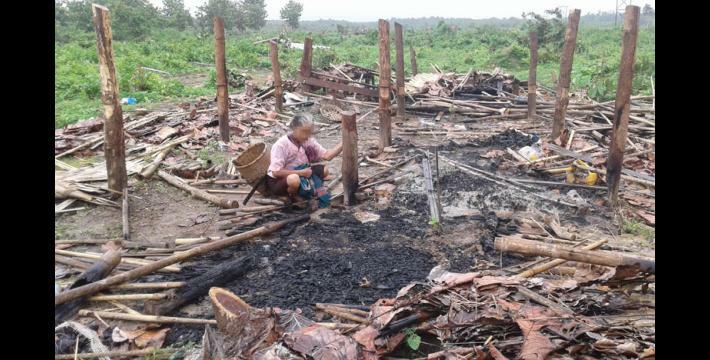 The villagers who lived in B--- village, whose ancestors lived there, and who had obtained the land titles to that land from the Karen National Union (KNU), had their village burned and looted by Burma/Myanmar police and officials from the Burma/Myanmar Department of Forest Management between June 22nd and 25th 2015, under the claim that it had been designated a forest reserve. 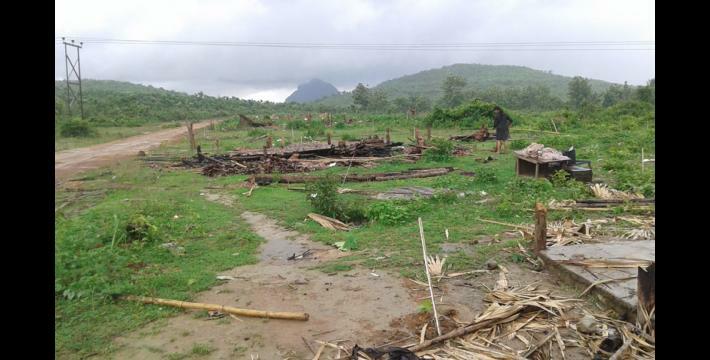 Prior to the raid, on February 1st 2015, U Zaw Min, the chief minister of Kayin State, forced 15 villagers from B--- village to sign a document in which they agreed to demolish their houses and move elsewhere within seven days. This deadline was later revised to June 21st 2015 when the police came to B--- village. Ma A--- reported that on June 2nd 2015, around 50 police officers came into B--- village and arrested 25 villagers, including the interviewee’s husband and father, in addition to her younger brother, who had already been in jail for two months at that point. None of these villagers have been released at the time of writing. 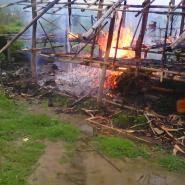 Other villagers have fled to the forest, monastery or their relatives’ houses to avoid being arrested. 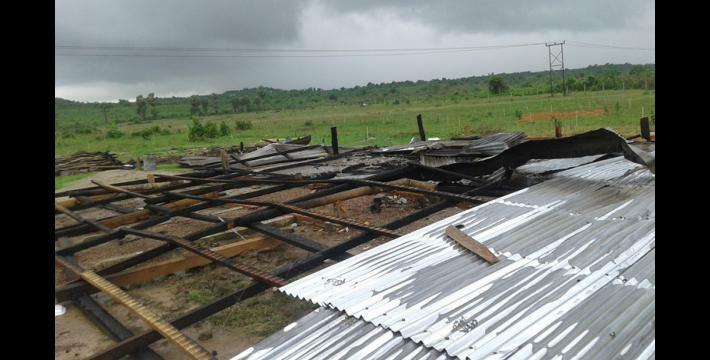 While the police were demolishing the villagers’ houses, they also looted the village, taking villagers’ valuables and the goods Ma A--- sold in her shop. 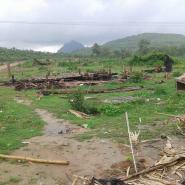 Following the destruction of the village, approximately 100 villagers, including Ma A---, fled to Myawaddy with the help of Saw P---. 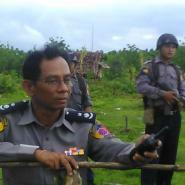 There are six school-age children in the group that fled to Myawaddy. 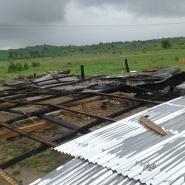 Their newly built school in B--- village was also destroyed. 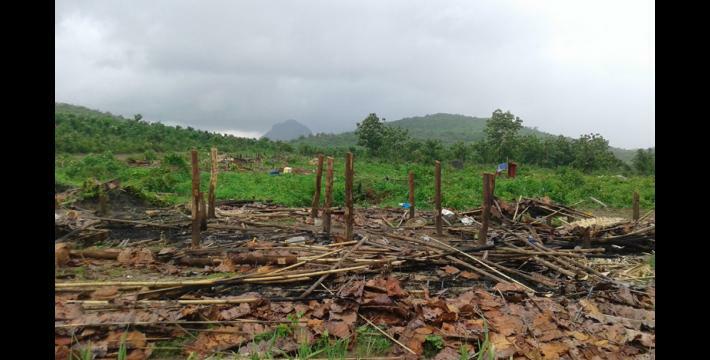 For more information on this incident see: “Forced relocation and destruction of villagers’ shelters by Burma/Myanmar government officials and police in Hpa-an Township, Thaton District, June 2015,” KHRG, August 2015. The following interview was conducted by a community member trained by KHRG to monitor local human rights conditions. It was conducted in Thaton District in July 2015 and is presented below translated exactly as it was received, save for minor edits for clarity and security. This interview was received along with other information from Thaton District, including seven other interviews, 92 photographs and five video clips. What is your name, Naw? My name is Ma A---. Yes, I am. 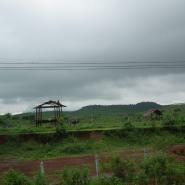 I was working on farming in [B--- village,] the place that I used to live. Now, they [police and government officials] said that the place that I used to live is the forest [reserve] land. As I know, it is not a forest land. I used to live there and that is my village. In 1983, Commander Myint Thein from KNLA [Karen National Liberation Army] Brigade #1 passed through Kaw Yin A Htet village tract, B--- village and arrested two French engineers who were working in Myaing Ka Lay cement factory. Therefore, villagers dare not live in B--- village [for fear of a Tatmadaw retaliation against the KNLA] and they decided to move to C--- village. At that time, the villagers worked on the hill fields or paddy fields in that area. After we finished working on a plot of land, we moved to work on a different plot of land, then moved to work on another different plot of land. There used to be many big trees. 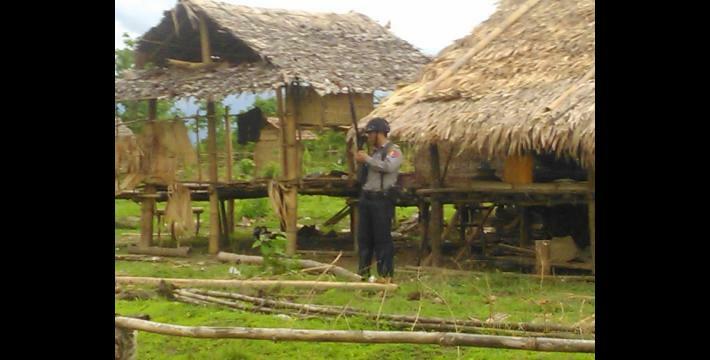 [The armed wing of the] KNU [Karen National Liberation Army (KNLA)] used to patrol there as it used to be their control area. As we were easily frightened, we were scared if we saw the Tatmadaw coming to our village. We didn’t even dare to show ourselves near the main road [Hpa-an Town to Yangon highway] during the 1988 students’ uprising. I was only a teenage girl at that time. There were a lot of lands owned by my grandparents in that place. Those who were village heads in the past were very good. [However], the one who is the current village head makes us feel disappointed. [I am] not only disappointed, I am also becoming poorer. He gets us into trouble. 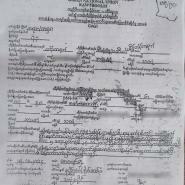 The poor villagers who do not have land to stay on [in C--- village (including Ma A---),] submitted their documents to get land grants [from the KNU]. I do not know much about the document submission [process]. What I know is that we had gotten the land grant produced by the KNU and we can live on the [B--- village] land. Then we [some of the villagers] decided to go and live there six months ago [in January 2015]. There were only a few houses there at the time [when we first moved back there]. The [rest of the] villagers dared not go to live there. The villagers were told [by the police] not to go and live there. If they went and lived there, they would be arrested and put in jail. [We went to stay there because we thought] we have the strong point [advantage] that the KNU stands for us and had provided us with the land grants and we thought that if we faced any problems they would address them for us. [However, on February 1st 2015], we were ordered to go to the [Burma/Myanmar government Department of Forest Management] office by the village head. He said to us, “You are ordered to go to the office. You have to go to the office. People will negotiate with you. The land that you took is very large. You will be given a smaller size of land. You will be negotiated with only about that issue.” We asked him [village head], “Who orders us?” He told us, “It is the [Burma/Myanmar] Department of Forest Management.” We were also afraid that we will be arrested but then we went [to the office anyway]. How many people went there? 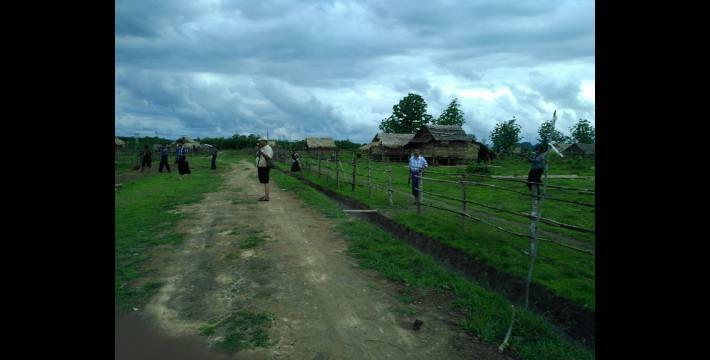 There were a total of 15 people who went to the office: the village head, Aung Thwin Aye [an elder], and 13 villagers. When we arrived at the Department of Forest Management office, we told him [village head], “We already arrived at the office and so let’s get out of the car!” He said, “We cannot get out of the car here.” We asked, “Where are we going?” He said, “We have to go to the [other] office.” We told him, “Today is Sunday. Isn’t the office closed?” [No response from him provided in the interview]. When we arrived at the office, we had to wait there and it took us quite long, as the office was closed. Then we told him [village head], “You said that you are going to negotiate and you have not even started it yet. We don’t have much time.” He said, “[U Zaw Min], the chief minister [of Kayin State], is in a meeting and he hasn’t come back yet.” [Ma A--- thought to herself], “Ay! He said that we are going to meet with the Department of Forest Management. Why we are going to meet with the chief minister?” I was very scared at that time and I was thinking, “Are we going to be arrested?” I was not sure yet at that time. Who are Paung Mon and Yay Khe? They are rich people. I do not know very much about them. All I know about them is that they are planting rubber trees and that they built their huts, from what I have seen. Are the villagers not allowed to go live there [B--- village]? 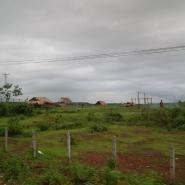 That is the villagers’ lands. There are four or five villagers who own the farms there. I do not know all of their names. Do you own any farms there? The lands were owned by our grandparents. The land has been passed over from the grandparents to their children or grandchildren step by step [from [censored for security]. Therefore, I do not know which plot of land is owned by which [of the grandchildren]. We also do not try to find out about it as we cannot read and write. He said, “You always say, ‘The land is owned by your grandparents,’ which I do not want to hear about.” Then he said, “You compare yourself to Paung Mon and Yay Khe. Now, we are suing them [as I never gave them permission to use the land], so we must also sue you. Take serious action against her!” He was saying that very aggressively. Then I didn’t dare talk about anything. I then told him, “Ba Ba Gyi [Leader], if we are not allowed to live there, we are not going to live there.” Then he said, “You have to provide your signatures. And you have to demolish [all of the houses] in seven days.” I then decided to demolish [my house] as I do not like [it when things are] complicated. When I arrived home, [I started] demolishing [my house]. Did he threaten you when asking you to provide your signature? What were they going to do to you if you did not provide your signature? If we did not provide our signature, we were going to have serious action taken against us and then put into jail. We were afraid of him and I dared not talk about anything. There was also one of my uncles who was talking in the front adding that he also did not have any place of residence to live in and he has to live in his younger sister’s compound. We were very scared because there were a lot of police [officers] in front of us. If he gave the order, we could have been put in jail. Then he said, “We are not finished yet.” He asked us to provide our signatures. We were sent back to the Department of Forest Management office and we provided our signatures. It was about 4:00 pm. When I went back home after I had provided my signature, I immediately [started to] demolish my house. I do not care if I do not have the land. I am not going to live on the land. I had demolished the roof of my house. My brother Saw F--- told me, “Don’t do this! You have built your house. It is not as if you do not have any document. 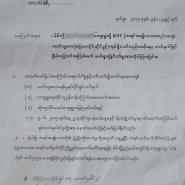 You have the document, land grants produced by KNU. You can live here.” Then I decided to continue living on the land. While we lived there, people always came and threatened us whenever they came to us. Who came and threatened you? 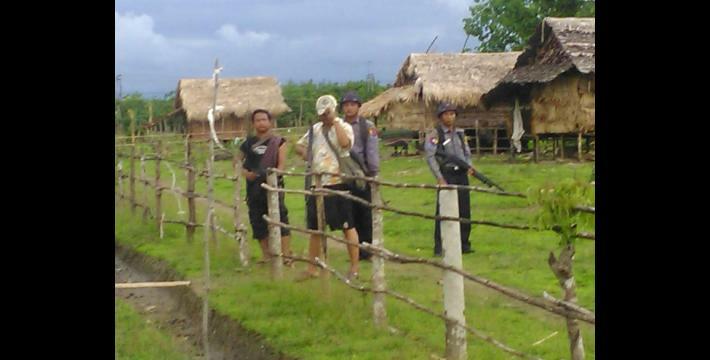 The people who came and threatened us are the village head and his colleagues who are the elders, Aung Thwin Aye and Aung Mo. What did they say when they came and threatened you? They came and said, “You cannot live here. You will be arrested and put in jail. 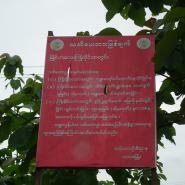 This is trespassing [on Burma/Myanmar government] land. You’re living on forest [reserve] land. You cannot live here.” They always came and told us like that once every one or two days. We [kept] living there because we have the [KNU] land grants and we are courageous. We thought that if people ask us [for the documentation], we would show them our land grants. However, we did not have time to show them our land grants when they came into the village. As soon as they turned up, they arrested U G--- and my younger brother Saw F--- and they were put in jail for two months. I do not remember the date. How many villagers did they arrest? Were there any females included? At 9:30 am on June 2nd , they came and arrested the villagers. They came and arrested the villagers by checking people with the names that they had on their list. They came and questioned us. They asked me, “What is your name? Where do you live? What is your ID number?” I replied, “I live here, in E--- [B---] village. I do not remember my ID number.” They asked, “What is your husband’s ID number?” I replied, “I do not know. You have already taken him. I cannot read and write.” The village head was smiling at me standing beside the police at that time. He was following the police at that time. They were arresting villagers till 4:00 pm that day. They said that if they could not arrest the men, they were going to arrest the women. At 4:00 pm, the policewomen came to arrest me. They asked [the people] where my house was. They asked, “Where is Ma A---’s house?” People replied, “She is not at home.” Then they asked, “Where did she go?” People replied, “We do not know.” I was looking at them from farther away. I know that they were going to arrest me on that day because they already decided to arrest me, so I ran away before they saw me. Therefore, I was not arrested on that day. They were trying to follow me [on June 2nd 2015 in the morning]. They said that I was hiding Saw I--- [villager]. They asked me to show them Saw I---’s house. I said, “I don’t know where he is.” They said, “You know.” Since they doubted me, they came to arrest me again [later that day]. They wanted to arrest Saw I---, Saw J---, Maung K---, Maung L--- and a monk. They asked me to show them where their houses were. I do not know where their houses are, as I sit in my shop and sell [goods] the whole day, [every day]. I was selling at the shop and minding my own business. Because they came and did to me like that [threatened to arrest me and destroyed my house], I have been very miserable and I am not able to be happy since then. I have been miserable because I do not have my own business anymore. They took or ate [and drank] all of the things that I sell in my shop, including the bottles of juice, beer, and thermoses, and all of the other goods that I have in my shop. Which day did they take [all] that? It was on the 22nd [of June, 2015]. Did they inform you that they were going to come on that day? 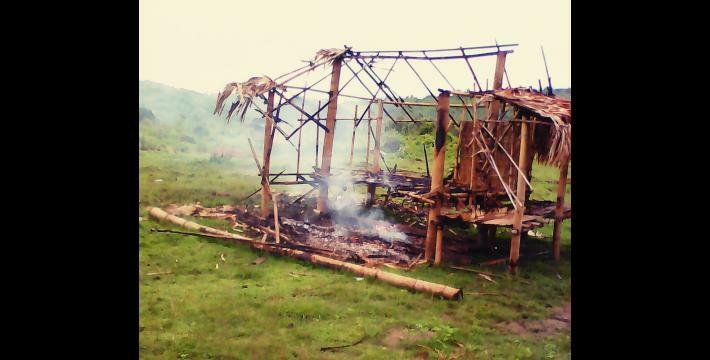 They asked the villagers to demolish all of their houses on the 21st [of June 2015]. Since my husband was in jail, there was no one who could demolish my house. I told them [the police] to arrange a place of residence [plot of land] for me so that I can move my house. They replied, “We cannot arrange the land for you. You have to find [one] on your own. We do not know about that.” Those who tell us like that are the outsiders [police]. I didn’t dare see the village head. I was afraid of him more than a king. Even if I see a tiger, I dare to run in front of it. For him, I don’t dare to run in front of him. I was afraid of him that much. He made me feel disappointed. Can you tell me how they came on the 22nd [of June 2015]? Selling [goods] in my own shop does not mean I am rich. I used to borrow the goods [from shops in] Set Yon market [outside the village]. The shop owners might [now] think that I had lied to them [since] I did not come to pay them. I have now lost my reputation. Since I am poor, I borrow the goods from them and sell them. It is not because I was rich [that I was able to be a] vendor. In terms of our house, my husband borrowed about 300,000 kyat (US $257.07) from his older sister to build our house. We thought that we were going to live here permanently so we were going to build a good house. It cost a lot of money to roof our houses as we had to buy some thatched shingles and some zinc. I also laid a concrete floor in front of my house for vending. All of our belongings had been lost so I am very disappointed. It is like my life has been ruined. In the past, my husband told me, “Let’s go back to Bilin Town and live there since we are not sure whether we can live here permanently. Whenever people come and talk to me [about the land problem], I don’t understand, as they speak in Karen and I don’t speak Karen.” He did not know anything about what had been going on. I always told him that we can live on this land. My husband is of Shan nationality and he speaks Burmese. Now, he is in jail. If he is released, he may blame me for us being in debt, as well as for us have nothing left. He may blame me as I did not listen to him. I also feel disappointed about that. Currently, I dare not go back to live in the village. One thing that I was told [by the police] was that I was stubborn because I had to demolish my house but I didn’t do it. That [being called stubborn and being hated by the police], I was afraid of the most. I told them [police] that since my husband was in jail and they had not released him, I did not know how to demolish my house. I cannot climb up the roof of the house and demolish it alone. However, they did not accept what I had told them. They said that I must finish demolishing my house by June 21st 2015. The day that my husband was arrested was on June 2nd 2015 and they [had] arrested 25 villagers [in total]. Can you tell me how they came and destroyed your houses? My house was beside the road. When they arrived, they stopped in front of my house. How many police [officers] were there? There were about 100 police [officers]. It also included some civilians including the forest [Department of Forest Management officials] and other elders [government staff]. There were about a total of 150 people including civilians and police [who] came. There were a lot of people. Who was the leading person? They were the village head, Aung Mo, and Aung Thwin Aye; these three people. What did they do after they came? They appeared suddenly in the village. At first, we were hiding beside the bamboo trees on the mountain which is not very far from the village and we were observing them. I was watching them from far away and they came and surrounded my house and ate the food that I had in my house. I was heartbroken when I went back home [and saw that]. I went back to my home at 6:00 pm after they were gone. What time did they come in the morning? They came at about 9:00 am and it was on Monday [June 22nd 2015]. How did they destroy the houses? They cut our house with a saw. They demolished our house; some destroyed the walls, some climbed up to the roof and destroyed the roof. I have three knifes and an axe in my house and they took all of them. They did not leave anything. They took all of the food and goods that I had in my shop. What about your rice? What did they do [with it]? I had a big tub of rice and they threw it away. Before destroying the village, they held a meeting with the villagers and they persuaded the villagers [of C---] to destroy the houses [of B--- villagers]. 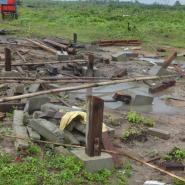 They destroyed all of the houses which were beside the road. Some people were destroying and some people [from the police and the Burma/Myanmar government] were planting the teak plants [trees]. 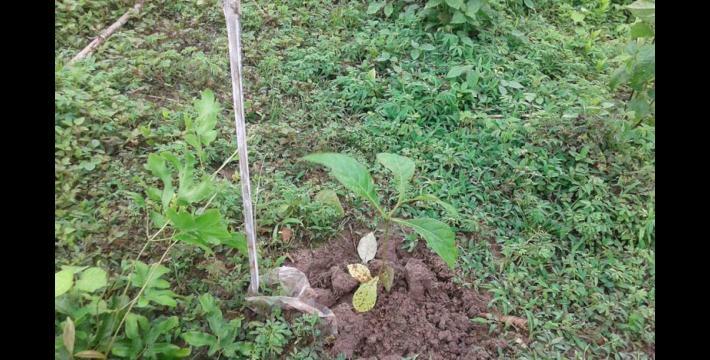 They planted a lot of teak plants at the same time on that day. Did they torch the houses after they had destroyed them? On June 22nd and 23rd they torched all the houses after they had destroyed them. Some houses were burnt down without cutting them [first], including [along with] the pots, plates and bowls [inside them]. They took all of the possessions from people’s houses. People said that they asked the other villagers who live beside the main road [in C---] to take them [the looted goods] and the [C---] villagers also took them. I told Saw P---, “Teacher! My life has been ruined. If you do not help us, there is no one who is going to help us.” I owe him gratitude and I do not know how to pay it back. Otherwise, [without his help] we, all villagers, including men and women would have been arrested and put in jail. [At the time when we were hiding in the mountain], Saw P--- said, “If you want to go hide in Myawaddy, then let’s go and hide. I will send you there.” We also told him, “Where are those who produced land grants for us [KNU]? Are they not going to help us? Ask them to help us!” I would have died hiding in the mountain. One of my children was very sick. He did not have much energy and could not walk very well. It was also very rainy the whole day when we were hiding. Did you have a raincoat? Yes, I had [one]. There were a lot of villagers fleeing. [While we were hiding in the forest], we heard that they are going to come and arrest us in the forest. Then, we continued to flee separately. Some villagers fled up to the mountain, some villagers went to hide in the monastery and some villagers went back to their relatives’ houses. Why were they arresting the people like that regarding this land? If they [the police and government officials] had done the right thing, there would not be any problems; since they had not done the right thing, it created problems. We, the villagers, do not lie. We are telling you the truth. [For example], “If our parents love us, there will be peace [at home]. If our parents do not love us, our siblings will go their separate [ways].” Now it is like that; even the village head can’t look us in the face [for not having resolved the land problem], we had to flee separately and our lives have been ruined. We said, “Sir! Teacher! Help us, please. We do not know anything [about how to address this problem] and they [the police] have done [treated] us very badly.” Since Saw P--- knows about the law, he said that he is going to help us [at first]. However, the village head said that he did not get along with him. So, it is like the person who works for the right thing and the person who does not work for the right thing cannot work together, right? That is our story. We had to flee from them [the police] until we arrived in this place [Myawaddy], as our houses were destroyed [and burnt down] and we did not have any place of residence. When we arrived at this village, people helped us with food. We are very happy. When we came to this village, we did not have clothes and people gave us clothes. Who gave you the clothes? I do not know. They are from an organisation. They also supported us with rice. If the rice is gone [finished], they come and give [us] more rice. We, I thank them very much. Only if you [KHRG researcher] help us, we will have a chance to get our land back and we will be able to go back and live in our village. If there is no one who is going to help us, we will continue facing problems. We are going to encounter more challenges than now and we do not know where we are going to be sent. My parents are also getting very old and if you [researcher] do not help us, we will not make it to go back to our village. We want to report about our problem that we are facing to you since we heard you went to visit E--- [B---] village. When you went to E--- [B---] village, we thought that you heard the good thing [truth] only if you met with the good people. If you [met with the bad people and] listened to them, our lives were going to be ruined. Now, [we want to know] how they are going to compensate us for our loss. How much does it cost, all of the things that they burnt down: your house and shop? 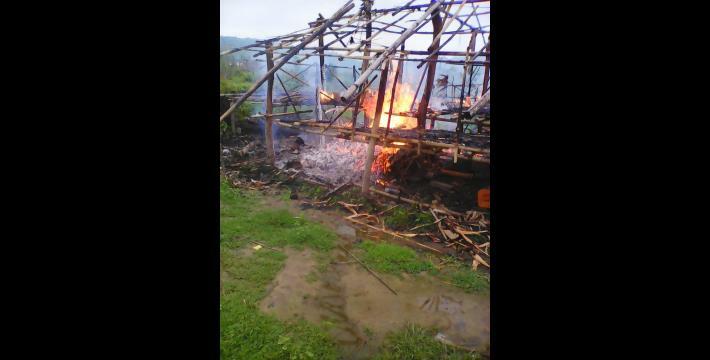 They also burnt down my small traditional house which was behind my house as well as all of the firewood that I kept under my house. They brought tires and petrol. They poured petrol around my house and burnt down my house. The price [of the destroyed assets] has been noted, it all cost 1,970,000 kyat (US $1,688.09). That is only for the cost of your house? Did the police take anything from your house? Yes, they took many things from my house. They took the zinc, finished timbers [that formed part of my house] and stilts that were still in good [condition after they had destroyed my house]. They took all of the valuable things. They left only the things which are not valuable and they kept them [the non-valuables] beside the road and the other villagers came and took them [for themselves]. I did not go and take any of it as I did not want it anymore. What I want [from the police] now is to get back our land. Please try [advocating] for us until we get back our lands. 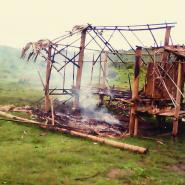 We have our land grants [that were] produced by the KNU, but they [the police still] did this to us. Therefore, we ask teacher [Saw P---] to help and he said that there are some people [NGOs] who are going to help us [to get back our lands]. I do not know any other people [organisation]. I have never been here in Myawaddy. This is my first time coming here. Now I met with you [researcher] and told you all about it. You can analyse whether it is right or wrong after you listen to it. [You can] leave it [be] if it is not right. What we want from them now is to give compensation for our lives which have been ruined by them. I mean those who burnt down our houses. Please help us make them arrange places of residence for us. We want to go back and live on our land. We were asked to go live beside Shwe Wa Htun road [Shwe Ni area, Kaw Yin A Htet village tract] and we were asked to draw lots [for plots of land there]. We do not want to draw lots because we do not want to go live there. I do not own any land [in C--- village]. 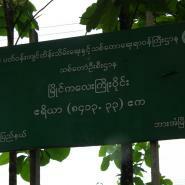 If you do not believe me, you can check my name in the Hpa-an [Township] office. I am not lying. My husband also had asked me to go and live in his village [in Bilin Township] but I did not want to go live in his village. I have been living in my village [B---] for 44 years. I was born in my village and I am also going to die in my village. Therefore, I do not want to go live in other people’s village. What I want to say to you is that my husband has not done any mistake. Why did they arrest him? It has been one month already. They have not let us know why he was arrested. What about your father? Was he released? No, he has also not been released yet. All of the 25 villagers are still in jail. When I talked to my father over the phone, he told me that he was sick and had a headache and he was going to die in the jail. He said that he did not have good health. And he asked me, “What are you going to do [to get us out of jail]? Are we going to continue being held in jail?” My father is someone who gets frightened easily and is a quiet person. He does not drink and smoke. What were the villagers working on for their livelihoods? They were working on hill farms and on paddy fields. Mostly, they are working at hill farming. I worked on hill farming. Now, people [wealthy individuals] have planted rubber trees [on the hill that we used for farming] and it became a rubber plantation. We do not have any place to work for hill farming. There is also no hill forest. Currently, there is no paddy field left, either. They said that the paddy field land was the forest land. I told them that I do not know when you recognised the paddy field as forest land. You did not let us know about it. The paddy fields which we used to work on in the past now became rubber plantations, rich people’s lands and forest lands. Therefore, we, the villagers, do not have any place to work. We depend on the KNU [to solve this problem for us]. What do you want to add, in terms of the fact that your house has been destroyed? What I want to say is that we [villagers and police] need to get along with each other so that we will have a chance to go back and live in our village. They also must guarantee that they will not disturb us and allow us to go back and live in our village and release those who are in jail because they have not done anything wrong, right? That is all I want. Now, we have to stay away, far from our parents [who are in C--- village]. We could not have regular meals in the past [after the village was burnt down and before we arrived in Myawaddy]. We could [only] have regular meals when we arrived here. When we were fleeing, we could not have meals. We had to flee the whole day. We had to ask for rice from other people’s houses, to say, “I am very hungry, can you provide me a meal?” I also felt shy and didn’t dare eat very much, the way we wanted to. We also didn’t dare go back home to cook [our own] rice. That is what I have experienced. To be honest, l don’t dare to go back [to my village] now. 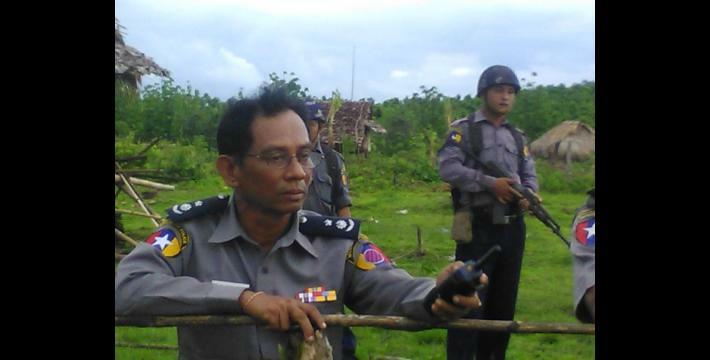 I am so disappointed [in the Burma/Myanmar government and police]. Did they say that they are going to arrest you if you go back? Yes, they said that they are going to arrest me. People also phoned me not to go back to the village. My friend told me [on the phone], “They are trying to follow you [and asking information about you]. They want to know why we came [fled] to Myawaddy.” People said that they have also sent some detectives to find out information about us. They know that we are staying in the monastery. People think that the monk will not be able to provide us with rice anymore, [but] yes, the monk can. There are some people who feel pity for us and provide us with food. The medicine is also provided. People provide food, clothes, mats, mosquito nets, and everything that we need. We did have these things when we lived in our village. To be honest, in our village, there was no one who pitied us and who was going to help us. They do not pity each other. They [police] told me that I am very talkative and whenever I was asked something, I could respond to everything. I told them, “You said that this land is the forest [reserve] land but there are no trees. Where are the trees? Show me. 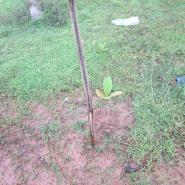 There is only grass and small plants.” As I see there are no big trees, I told them that it is not a forest reserve. I argued with them like that. Ye Min Aung [Hpa-an Township administrator] and Thein Aung [Hpa-an Township Forest administrator] came and argued with me about that three or four times. One time, they came to me at midnight, 12:00 o’clock, when I was sleeping. About 35 police and the village head came into our village and said that we cannot live here and we had to demolish our houses. Why did they come at midnight? We asked them why they came at midnight and they said that they are not going to do anything to us. Villagers told them, “If you are not going to do anything to us, don’t come at night time. Come at daytime. Coming at night time is insincere.” Later, they came at daytime. Since they had come to the village many times, the villagers were afraid of them. Now, we have come here [to Myawaddy]. Some villagers were afraid and they didn’t dare come here. Since we cannot feel [afraid] and stand it anymore, we decided to come here. 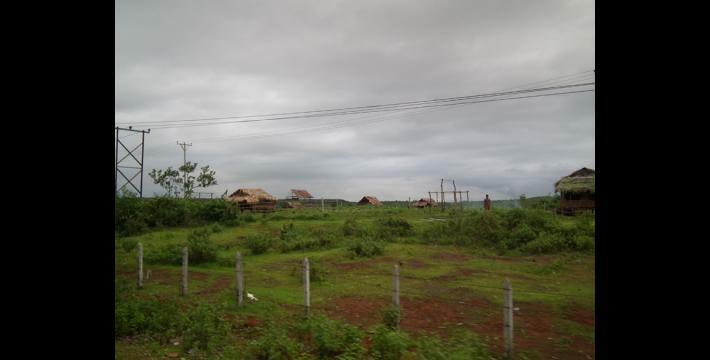 How many villagers came to stay here [in Myawaddy]? There are a total of about 50 villagers who have come to stay here. Are there any students [villagers’ children] who came here, as well? There are six students who came here with us. They are missing school for this year. If we can go back to our village, they will be able to continue their schooling. If we cannot go back, they will not. They have been attending their school for only two or three weeks [this year] before the conflict started. Since the conflict started, they were not able to go to school. Was there a school in your village? A school has already been built in our village. 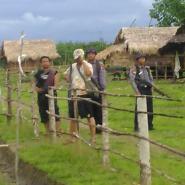 The day that the school just had been built [finished being constructed], the police came and arrested the villagers. Did they destroy the school? Yes, they burnt down it. 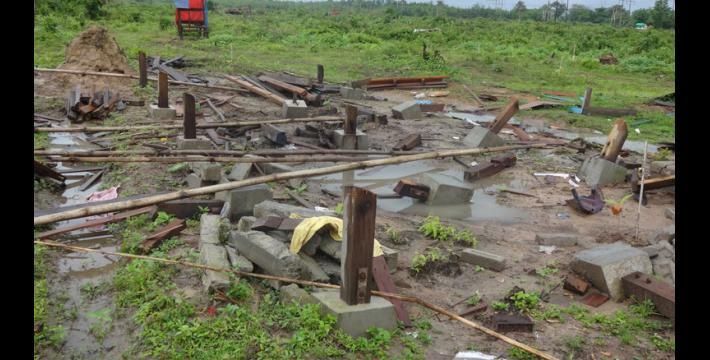 They destroyed [everything,] including the teacher’s house, school tables, and desks. We had collected 2,000 kyat (US $1.71) per house to build that school. But they destroyed all of it. You will not see any stilts from the house left in the village because they have dug out all of them and then made the land plain. They said that they did not want to see any piece of wood left. 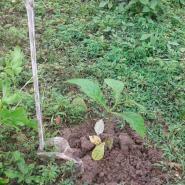 Now, they have planted teak trees all over the land, which [still only] have two leaves [since they are young]. 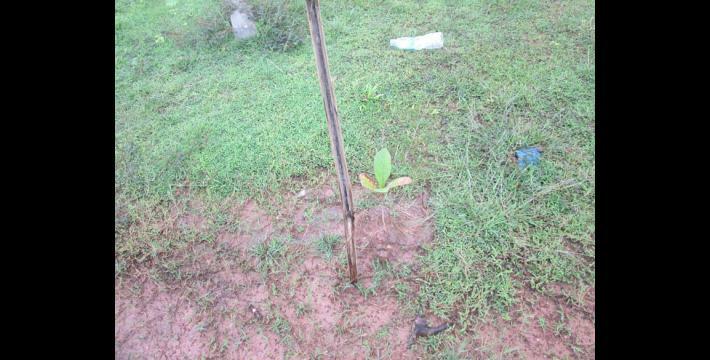 They started planting the teak trees on June 22nd 2015. Do you want to add anything else which I have not questioned you about? This was all [I wanted to mention] about my feelings. 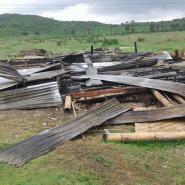 [I would like to know] how they are going to arrange our place of residence, the compensation for what they have burnt down; our houses including the chickens, which the police shot to eat. I had 40 chickens that I raised in my house. When I got into the car [to come to Myawaddy], I saw that my pigs, dogs and chickens were running around and the police shot them to eat them. We thought that police are doing this to us and there will be someone who is going to help us so we decided to come and stay here. We asked help from our teacher. He is our kyay zu shin. Now, we meet with you [researcher] and you are also our kyay zu shin. We will not forget our gratitude to anyone if we have the chance to go back and live in our village. The people who help us are Karen people, not the Burmese people. Naw is S’gaw Karen title used for women, before their name. In this context, the interviewer is showing respect for the interviewee by referring to her as Naw, ‘older sister’. 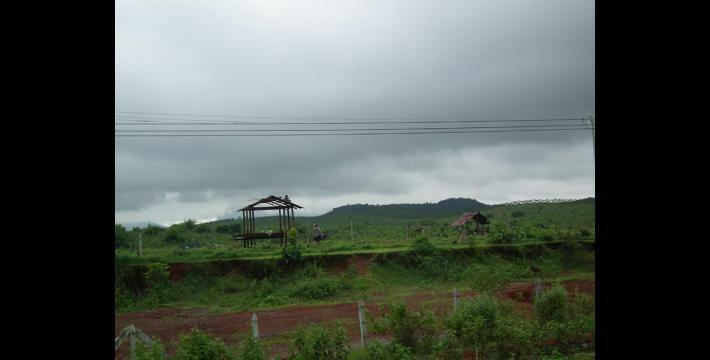 D--- village is located on both sides of the main vehicle road from Hpa-an Town in Hpa-an District to Yangon. 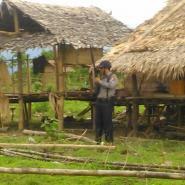 The village is a Karen village in which villagers mostly do subsistence farming. D--- village is divided into two parts, B--- which is the upper or eastern part, and C---, which is the lower, or western part. The two parts are separated by the vehicle road. 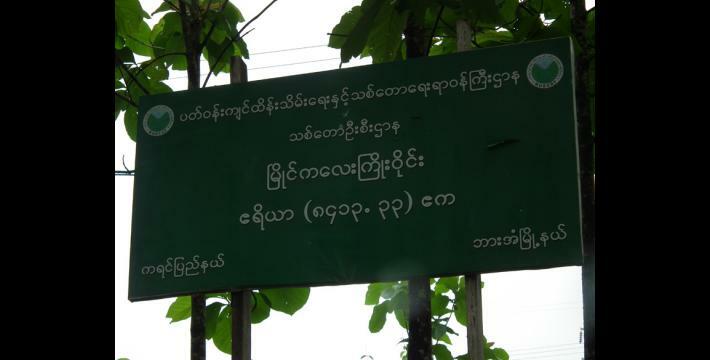 B--- is a disputed territory, as it has been designated as a forest reserve by the Burma/Myanmar government despite villagers proclaiming it their inherited land and place of residence, and despite the land not actually containing a forest. 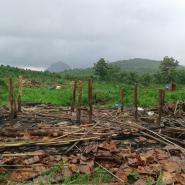 For further information, see, “Forced relocation and destruction of villagers’ shelters by Burma/Myanmar government officials and police force in Hpa-an Township, Thaton District, June 2015,” KHRG, August 2015. On October 15th 1983, the KNU kidnapped a French engineer, Jacques Bossu and his wife, who were working in Myaing Ka Lay Town. The couple were taken by the KNU through Kaw Yin A Htet village tract on their way to Manerplaw, Hpa-an District. The KNU then demanded that the French government cease all aid to Burma/Myanmar if they wish to guarantee their release. Despite their demands not being met, the KNU freed the couple on humanitarian grounds on November 25th 1983. For more details see “Burma: Anti-Government Rebels Free Kidnapped French Couple,” Reuters, November 1983. The interviewee does not directly answer the question. 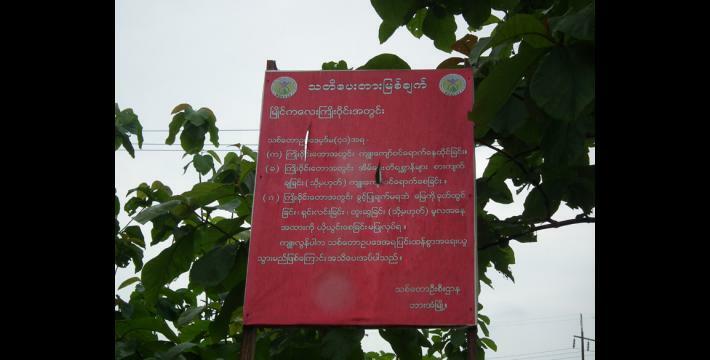 The villagers whose ancestors lived in B--- are not allowed to live there according to the Burma/Myanmar government, however there are four to five wealthy individuals who have bought land there and were allowed by the Burma/Myanmar government to use it. However, Chief Minister of Kayin State, U Zaw Min claims that since these wealthy individuals overstepped his authority, their use of the land is not legitimate, either. 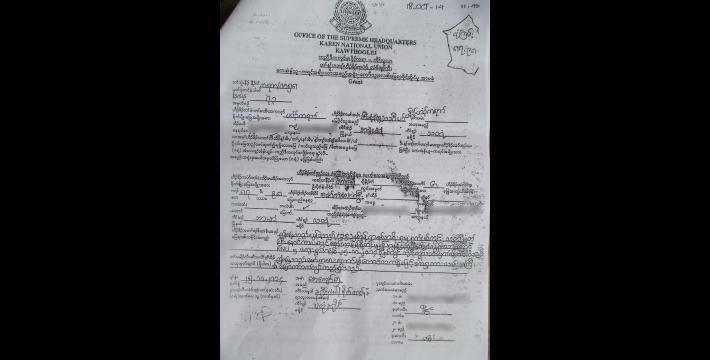 Myaing Ka Lay Chief of Police U Win Hlaing. After this interview was conducted, KHRG received further details about the arrests in B--- village. According to subsequent reports, on June 2nd 2015, 23 villagers and one monk were arrested, totalling 24 villagers on that day. In addition, three more villagers were arrested on June 22nd 2015, bringing the total number of B--- villagers arrested to 27. The police came into B--- village on June 2nd 2015 twice. First, before 9:30 am, to take down villagers’ names. Then, they came back with 50 police officers to arrest the villagers whose names were on the list. Ma A--- confronted the policemen earlier in the day, before the policewomen came to arrest her at 4 pm. 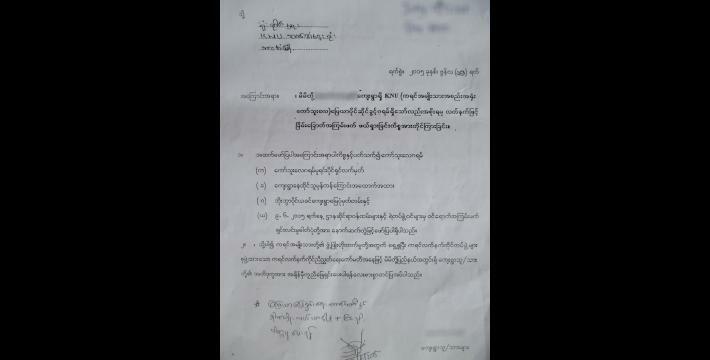 As Ma A--- recalls earlier in the interview, the initial deadline given to the villagers to demolish all the houses in B--- village was February 8th 2015 (seven days after the meeting with Chief Minister of Kayin State U Zaw Min), however subsequent visits by the police and Burma/Myanmar government officials indicate that the deadline was revised to June 21st 2015. All conversion estimates for the kyat in this report are based on the August 4th 2015 official market rate of 1,167.00 kyat to the US $1. 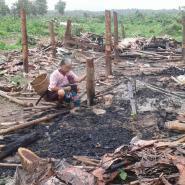 It is common in Burma/Myanmar to use pieces of rubber to start fires. 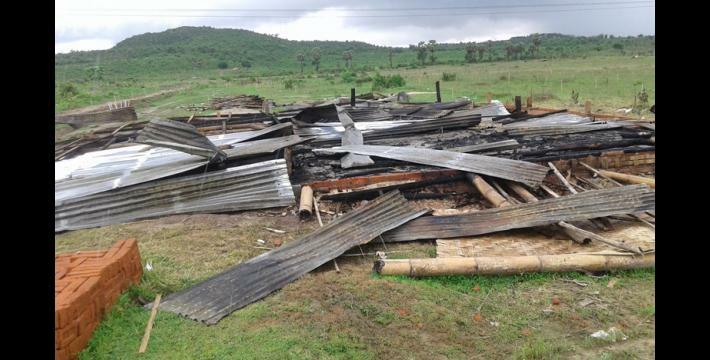 The police and/or people from the Department of Forest Management likely lit the tires on fire and threw them into villagers’ houses, for a quicker demolition by fire. Ma A--- estimated the number of B--- villagers who fled to Myawaddy at 50, however further investigation by KHRG indicates the number of B--- villagers in Myawaddy is closer to 100.